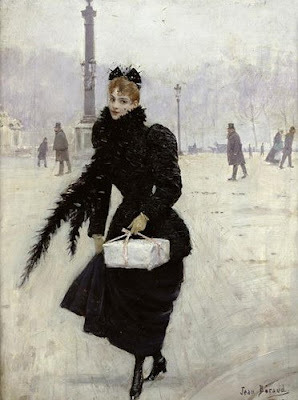 Here’s a painting of a 19th century French woman briskly walking through a wintery, cold town square. She briefly stops for a short glance at the painter, but seems a bit annoyed at his interest in her. She’s coming from the French bakery where she got a box of pâtisserie. I imagine she is hurrying home to the warmth of her fireplace where she can warm her feet and hands. Not only is she longing for a hot cup of coffee, but she’s quite anxious to taste her fresh sweet treats. Previous postMy Marie Antoinette painting is published in Artful Blogging! so beautiful. i can just imagine myself in that scene.